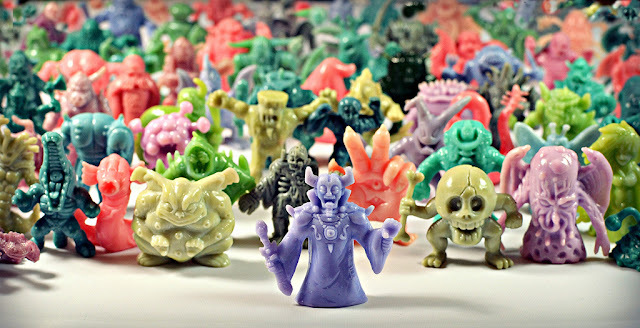 Little Weirdos: Mini figures and other monster toys: Neclos Fortress: New website / figure archive! Neclos Fortress: New website / figure archive! Are you a fan of the awesome Japanese keshi line Neclos/Necros Fortress? Or do you think you might want to become one? Then go check out a new Neclos website I put together at NeclosFortress.com! I've been big into collecting these toys for a while now and thought there needed to be more information on them out there, so I began working on this site a few months ago. It includes an archive of its over 300 figures and cards, background info on the line, a photo gallery, and even a Neclos-specific forum. I hope fellow Neclos fans find it useful and enjoy looking around! That's a fantastic site you've put together - much easier to navigate than the usual site I visit for Neclos information (which now only shows a 404 error!). I've only got nine Neclos figures myself (REALLY hard to find these, unfortunately), but at least they can be readily looked at now, cheers! Oh, and that group shot you've got there's fantastic too. Thanks, glad you like it! Yeah, the challenge is you usually have to get them from sellers in Japan which drives up the cost. Sometimes I get extras for sale--if you want I can let you know when I have some. I really can't afford to start collecting another line... but I will check out your site in depth. Neclos Fortress is fantastic. You have officially hooked me which i both love and hate you for! Hahaha. Not the easiest/most affordable toys to collect, but totally worth it.